Gorgeous vibrant colors. Love your card!! This is just gorgeous, Yana! You’re such an inspiration with those colored pencils! Gorgeous card. Your coloring is amazing. What an outstanding card. Your coloring is so beautiful! Now I have to have the polychromos pencils and that stamp set! I also love the grey paper. It makes the coloring stand out so nice. Beautiful as always! You are so creative! As always your coloring is beautiful! Wow! Just gorgeous! 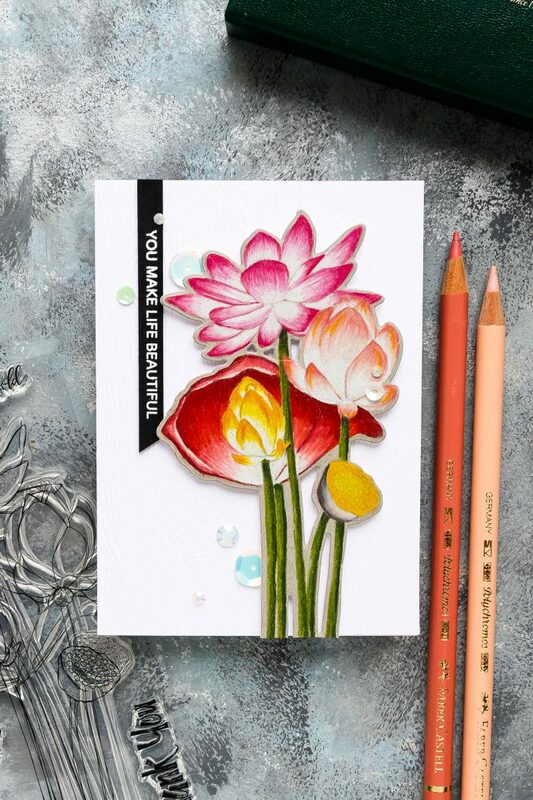 I love how vibrant you got the lotus flowers using the colored pencils. Perfect sentiment for those beautiful flowers. 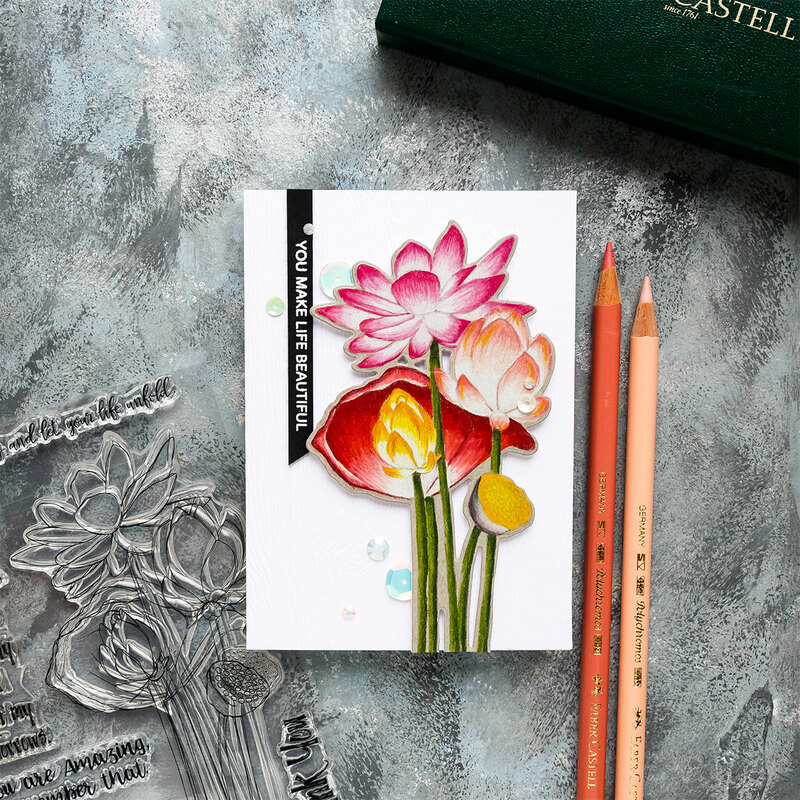 Always love a beautiful floral card. What a stunning card … the flowers are so beautiful and you colored them so well. I always know I am going to get inspiration from any of your projects and this card is no exception! The colors are beautiful and your card is stunning. Love this set. One of my favorites for sure. You know, I don’t have a die cutter and by the time I can get one, people will be on to the next new thing and this will be old hat. That being said, I love how your flowers came out! I see you used my favorite color in the whole wide world, yellow, in your flowers. They are so colorful! I would not have known one of them was a leaf because it doesn’t look like it. Thanks for showing us your colorful, pretty flowers and for giving us the chance to win something. Gorgeous card! Those colours are fabulous! The way you colored these flowers is just beautiful! I love your color choices and your design! Very nice, thank you for sharing. Love your coloring and the colors. 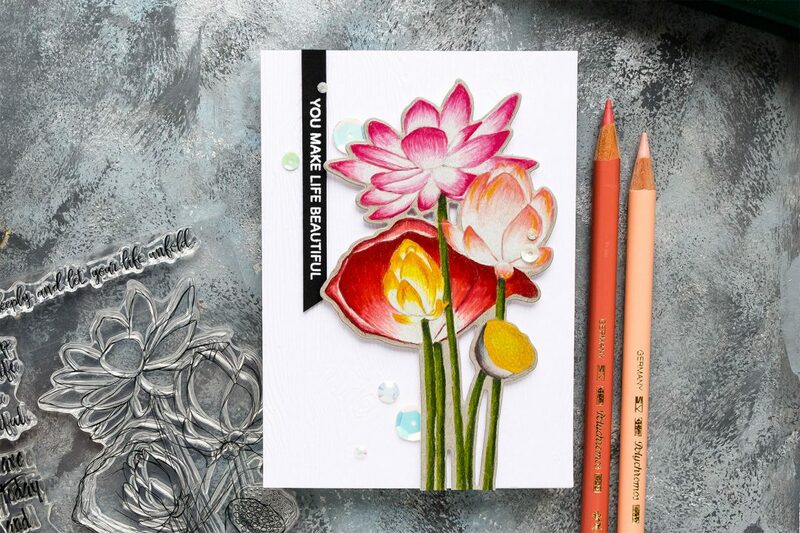 Your card is stunning Yana that new Lotus flower stamp is a must have!! What beautiful colouring! Your lotuses (leaf or otherwise!) look fabulous! 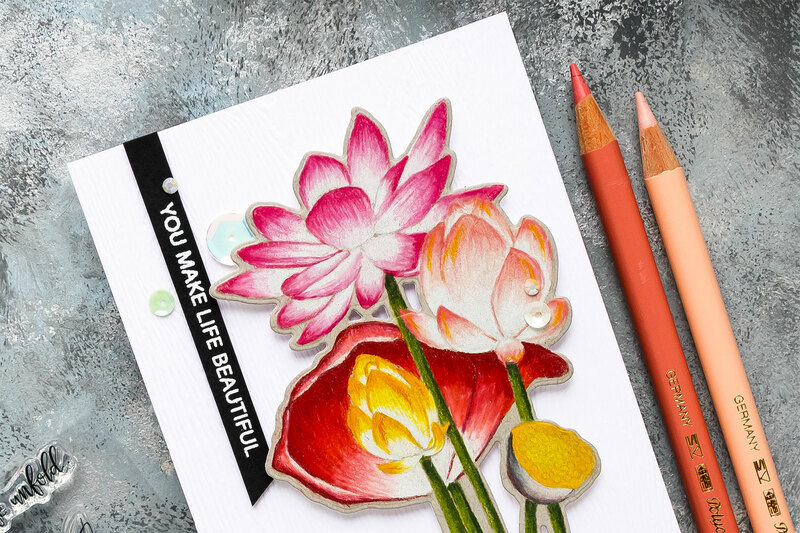 Love the card and enjoyed the tutorial on using colored pencils. This set is growing on me and love the bright colours you have used. Beautiful colouring of the blooms! Great card, love your coloring and the colors you used. Thanks for sharing. Gorgeous as always, I love it when you colour with pecils. This is a great stamp and die set from the new SSS release. Thank you for showing the colouring proces. That’s amazing what you have achieved with pencil crayons. Your card is stunning ! Love the lotus. Beautiful card. Wow! 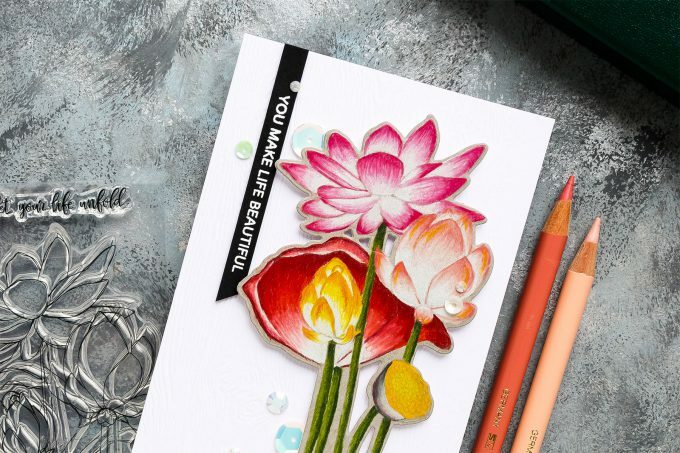 Absolutely beautiful card you’ve made! Thank you for sharing. Love your no line coloring.. so glad you have a video too! Gorgeous card! I always enjoy learning from you. Beautiful, Yana! Fun to see the video process. Great Stamp! Love the decorated bright colors. I’m in a non crafty phase right now but watching videos for ideas. Thanks for the inspiration. It’s a rainy day in Missouri so maybe I’m going to show my craft room some love! Beautiful card. I love that stamp set. Thanks. so wish I had the patience to color like that. Thanks for the great inspiration. The card is really gorgeous. And the new release is absolutely fabulous!